Quote: "Many of life's failures are people who did not realize how close they were to success when they gave up." Thomas Alva Edison was born in 1847 in Milan, Ohio. As a young boy, Edison was constantly asking “why.” If Thomas had been born today, he probably would have been diagnosed with ADD (attention deficit disorder) and prescribed medication. In addition to his “scattered thinking,” Edison suffered from a hearing deficit, which caused problems at school. His teacher thought Alva asked too many questions and said he was "addled." When this comment was revealed to Edison’s mother, a former schoolteacher, she took over her son’s education and taught him at home. When Edison was a young boy, the widespread use of electricity was just a novelty or fad. Candles or gas lanterns lit most places. Contrary to popular myth, Edison did not invent the light bulb. He did, however, improve upon an existing incandescent bulb. Edison’s improvements made it practical and allowed the bulb to burn long enough to light a home. Following this improvement, he and his staff invented the electric power system, which brought electricity into homes. By the time Edison died, entire cities were lit by electricity. This is primarily because of the efforts of Edison – an inventor and scientist who created a better future. During his lifetime, Thomas Edison was awarded 1093 patents. He still holds the record for the largest number of US patents held by one individual. Edison died in 1931 at the age of 84. 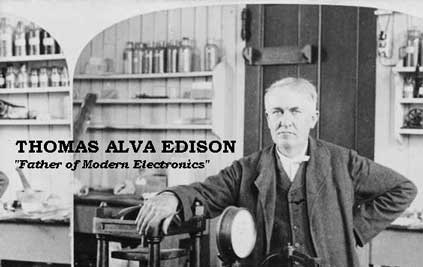 Because of Thomas Edison’s inventions you can listen to music on the radio or stereo, watch movies and television and even use a modern computer. And last, but not least, you can “flip” a switch to light up and power your world. Not a bad invention! 2019 by Broad Reach Entertainment. All rights reserved. No part of this website may be copied or redistributed without written permission from the owner. Site design and hosting by Ryland.net.